Far more insidious, more corrosive and dangerous than the Governor of New Jersey playing traffic warden is the story of Gov. Chris Christie’s secret meetings with a gaggle of billionaires ”“”“and the legality of the spending by the front organization set up following these hidden hugger-muggers. In 2012, a tax-exempt “social welfare organization” called Committee for Our Children’s Future, CCF, ran a series of TV ads telling America that Governor Christie has performed more miracles in New Jersey than Jesus did with loaves and fish. The New York Times found some old college chums who said they set up the “Children’s” crusade for Christie. But the ads cost about $6 million. The Times didn’t ask how Christie’s buddies, not wealthy guys, found the six big ones. But CCF was not started in 2012. When I heard “Children’s Future,” my nose started twitching. I smelled Koch. Get the full story of Chris Christie and his Koch addiction in the book, Billionaires & Ballot Bandits: Greg Palast investigative Karl Rove, the Koch Gang and their Buck Buddies and the film of the investigation on the DVD Vultures & Vote Rustlers. The whiff of sulfur took me back to seven thick investigation binders nearly two decades old ”” each one marked “KOCH.” In Volume 3, I found it: CCF–Campaign for Our Children’s Future. Just days before the 1996 election, “Campaign for our Children’s Future,” previously unheard of, paid for some of the most vicious smear ads ever run. The nasty blast, disseminated in coordination with a mysterious operation called “Citizens United,” accused one Democrat of associating with a child molester (false), one of beating his wife (true), another of being “a Jewess” (true) and so on. Most of the twenty-nine targeted Democrats, blindsided and unable to swing at the phantom “Children” and “Citizens,” were creamed. The result, to everyone’s surprise, was that the Republicans kept control of Congress. Everyone’s surprise but Charles and David Koch. The head of “Children’s Future” confessed to federal investigators he’d signed over $700,000 in blank checks to an anonymous donor running funds through Children’s. The money-laundering operation was traced back to a funding source called “Triad Inc.” ”” named after the Chinese mobsters. Triad’s front man, facing hard time, swore that all the hidden loot came from Koch Industries, owned by Charles and David Koch. And that was a crime, one of the two times the Kochs came within kissing distance of prison cells ”” because, in 1996, before the Citizens United ruling, America still had a democracy, and it was a felony for corporations to slip cash to political campaigns. And Citizens United? It was, in practice, just one citizen, right-wing-nut billionaire Foster Friess. In 1996, he and rich friends would put cash into Citizens United which then made campaign contributions, for the exact same amount, on the very same day, to one of their favored politicians. The sums and timing were a “coincidence” said the “Citizens” lawyers. But it looked an awful lot like a crime: an illegal way around campaign contribution limits. That was Thompson’s mistake. The Senator was stripped of his powers as Chairman of the Government Affairs Committee, denied his demand to subpoena anyone around the Kochs, and his investigation was shut down. 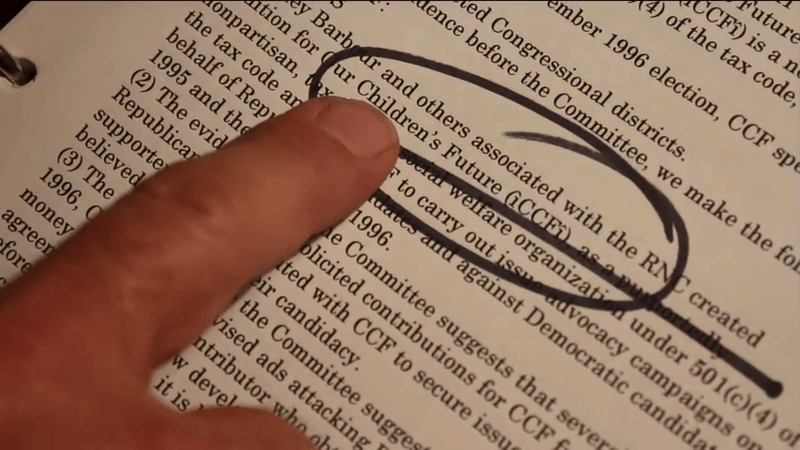 And now we know: the “future group” would be, apparently, the re-formulated CCF, now as Committee for Our Children’s Future. And apparently, our children want Chris Christie. But this time around, dumping hidden money into a campaign to boost a politician has been de-criminalized by the Supreme Court’s 2010 ruling that threw out charges against the old Friess front, Citizens United. So who are the men who care so much about our children’s future? Despite the Supreme Court stripping naked almost all restrictions on political expenditures, the Justices did firmly secure a critically-placed fig leaf: “Independent” organizations may not, in any way whatsoever, plan with, secretly coordinate with, make or take suggestions from, nor consult with, a candidate. The question is, did the Kochs and Christie drop the fig-leaf? The answers are a hell of a lot more important than Sopranos-style score-settling like backing up a bridge. Let’s look at the evidence. The hidden funnel of funds into Our Children’s Future followed undisclosed meetings, the first, a two-hour rendezvous between Governor Christie and David Koch in New York in January of 2011. Just the two of them, no one allowed in. And that was the second secret meeting: the Kochs’ closed confab in Vail, Colorado, on June 26, 2011. The guest of honor at the bash: Governor Chris Christie. But you’re not supposed to know that. Now you may think it’s pretty hard for Christie to conceal himself, but the Governor did his best. This was some time after Governor Mark Sanford was excoriated for disappearing for a few days, in Sanford’s case to meet his girlfriend. Similarly, Christie left off his schedule any mention of his travel to Colorado for the tryst with the Kochs. Christie was feted at the billionaires’ bacchanal ”” and he returned the favor. The hidden recorder captured the Governor saying, “We must cut Social Security, cut Medicare, cut Medicaid.” It was Christie tough-guy talk that, notably, he was too cowardly to repeat in New Jersey. He told the awed ultra-rich that, by cutting teacher pensions, he could stop Democrats’ attempts to tax millionaires. Christie told the billionaires that The Lord Himself had anointed them to rule America ””if only the moochers would stop torturing them with stupid environmental rules and taxes. The Kochs had already received their pay-off from Christie ”” that is, Christie saved America’s future. The brothers Koch stand to profit by approximately one billion each per year if the XL Pipeline is built. Therefore, defeating laws to cut greenhouse emissions is crucial. On May 27, 2011, after his secret meeting with David Koch and just before sneaking off to Vail, Christie stunned New Jersey by pulling the state out of the Regional Greenhouse Gas Initiative. After the Vail meeting, there were reports that a gaggle of billionaires had launched a campaign to draft Christie as the most-electable alternative for the Republican Party’s presidential nomination ”” about the same time as Chris Christie’s college roomies decided to chip in $6 million for old time’s sake. David Koch was on the Weâ™¥Christie bandwagon, of course ”” joined by the one billionaire more influential, more cunning and more forbidding than any Koch: Paul “The Vulture” Singer. Note: You’re not called a “vulture” by Wall Street for your philanthropic work. Then, billionaire Ken Langone also joined the Christie parade. Langone, I disclosed in Salon, was the money behind the company that, in 2000, purged thousands of Black voters from voter rolls in Florida. Later, he was charged with insider trading by Eliot Spitzer and, after charges were dropped, announced that Spitzer “would pay.” Langone implied, true or not, that he’s the one who busted Spitzer’s career. Langone is not warm to business regulation. Singer the Vulture is Chairman of the Manhattan Institute, a think tank that generates anti-regulation propaganda. In May 2010, Governor Christie made a pilgrimage there. Why? Singer is the brain in Restore Our Future, the super-PAC The Vulture funded with billionaire Harold “Ice-Man” Simmons (who died in December), and notably, the third Koch brother, billionaire Billy Koch. It was right after the rogues’ gallery of billionaires made their secretive push for Christie that CCF spent $6 million to praise the Governor. Notably, the spokesman for both Restore Our Future and Committee for Our Children’s Future, and the only identifiable operator for CCF, is an outfit called Black Rock. Also, Politico reports that something called Arena Communications of Utah, a recipient of at least $670,973 from Restore Our Future, is virtually the sole donor and operator of the mysterious and short-lived Draft Christie for President Inc. Question: If Governor Christie is such a straight shooter, then how come he left the Vail and Koch meetings off his schedule? What did he say to The Vulture in Manhattan that got the billionaire bird all excited? And do you want us to believe that in none of these secret gatherings that preceded the million-dollar ads, that there was no coordination, no consultation, no discussion whatsoever of the Governor’s campaign needs? While my files are thick and the Vail tapes invaluable, I’m not going to pretend that I know the words they whispered in their chit-chats. That’s what subpoenas are for: and these would have to be served on the Governor himself, The Vulture and the Kochs. It’s said that Christie’s failure to question his staff about the GW Bridge jam-up makes him an oddly uncurious fellow. And Mr. Christie is steadfastly un-curious about how his old college friends found $6 million to spend ”” and, coincidentally, turned their operation over to the outfit that handles CCF’s funds. How many coincidences do we need before we can conclude that the legal line was crossed? While we need to know what the dipwits appointed by Christie did to our bridge, more important is what the Governor said to the billionaires in secret that opened their otherwise tight wallets”¦ and whether that loot found it’s way to CCF. Singer the Vulture once tried to bully my network, BBC Television, into backing off our investigations. But I’m not worried ””though I would like to know why the Governor of New Jersey and the Kochs are putting traffic cones across my driveway. Greg Palast’s new film Vultures and Vote Rustlers was just released last month. HELP US FOLLOW THE MONEY. Visit thePalast InvestigativeFund’s storeor simply make a tax-deductiblecontribution to keep our work alive!